Did this Wednesday July 29, 2009 at work. I am catching you Paul. We had a 23 year old rider yesterday who is trying to get on the job. He works out and looks in good shape. We told him to do this workout with us and kind smerked "like that's all you are doing?" Well he did it and almost died and wanted to give up. He called this morning to let us know he is sore and is going to start doing this type of workout and couldn't believe how hard it was. Mike, Great job. You can substitute 500M Row with 50 Sumo Deadlift high Pulls using 45 lbs. It is almost the same with the same type of movement. Until today I had forgotten how much I love rowing! Thanks for the great reminder! Don't worry about the heat, before you know it we'll be fussing about how we can't hold the barbells because thier sooo cold. Discomfort and adversity are good for you! 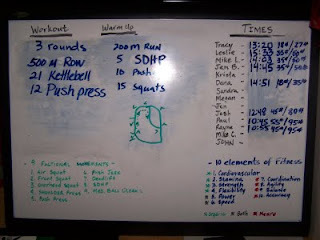 Although this workout wass hard sart to finish. I recovered quick. I think that's good for increasing my stamina/endurance. This was not to bad, I think the KB got me this time around. Hey Rayne I'm from Boston it doesn't get COLD here!! I still where shorts in the winter.